Once in awhile we get the opportunity to clean and preserve Christening gowns. When Ann K. sent one that is over 100 years old, we were ecstatic to have the opportunity! The gown was made of cotton lace and satin in different tiers of the dress. 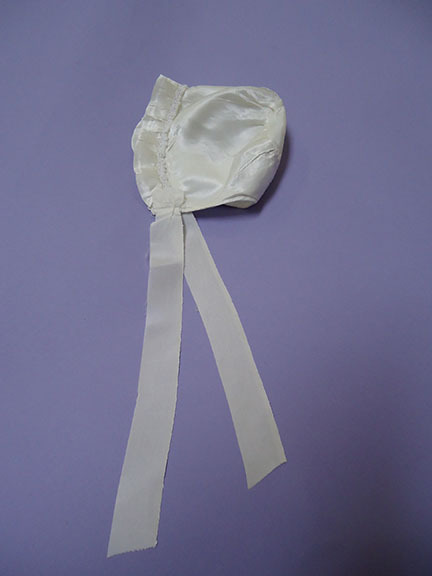 There were bows made from satin ribbons and metal snabs on the back. The neckline, sleeves and hemline were lined with lace trimming. There were small holes under the arms and the satin was slightly yellowed. The coat and bonnet, also lined with satin, had yellow spots and were starting to lose embroideries. This bonnet was worn over 100 years ago. When we received the pieces, they had been pre-cleaned with what appeared to be a dry-cleaning solvent. Between this treatment and the age of the gown, we knew that we had to be extra careful; we could not use any chemicals or hot temperatures. Before we started cleaning, we tested the fabric. We ended up hand cleaning each piece to get rid of any residual solvent.We repaired the shoulders of the slip, adding snaps for easier on and off. 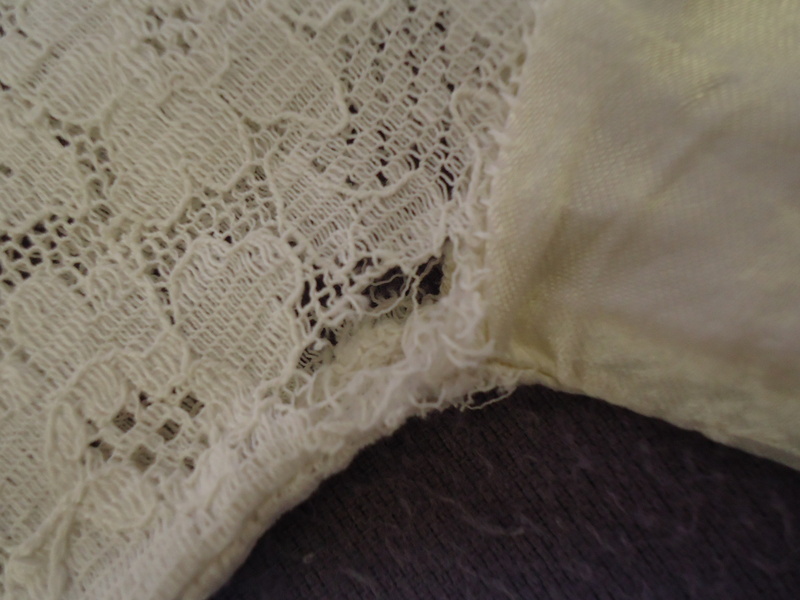 We also repaired the small holes on the lace of the gown. We were able to get the yellow spots out and ended the process by hand pressing each piece at a low temperature. We were able to resew this tear and similar ones. The beautiful lace had begun to unravel. Hello. I have a 72 year old cotton Christening dress and slip that became yellowed and has some brown spots on it. I washed it in ivory snow, but I was probably not gentle enough and the lace has detached creating 2 small holes. I would like it to be able to be used again for my cousin(Goddaughter’s) grandchildren. She was the last one baptized in it. I just inherited my great grandfathers christening gown. It is not in good condition, but i would like to preserve it as best i can. Any recommendations? Of course — US! Send us a picture of the gown to support@heritagegown.com and we’ll see what we can do! I have a brown taffeta petticoat that may have been part of my Grandmothers wedding dress. She was married in 1905. I just found that it may have moth holes. Can anything be done to save it/repair it? 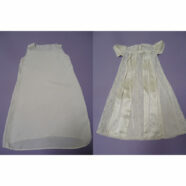 I have 2 baby girl dresses that my 2 girls were blessed in & they are in great condition except maybe some spit up but one is 2 years old & the other just a week, but I would just like them to be preserved so I don’t have to worry about them turning yellow years later.